The aftermath of the historic storm yesterday. Pictured is The Office, looking from the door behind the bar. It looks like the menu is now a 3 course tasting (with 4-5 options for each course) with 9 options a la carte. No substitutions, so you can't order anything from the tasting a la carte. And I'm hearing that the entire party has to participate in the tasting? kathryn wrote: It looks like the menu is now a 3 course tasting (with 4-5 options for each course) with 9 options a la carte. No substitutions, so you can't order anything from the tasting a la carte. And I'm hearing that the entire party has to participate in the tasting? Just got back from the Aviary, and I asked the wait staff about the new menu. They're actually in a transitional state. From what I understand, they will later offer 3-course tasting only, without any a la carte. On the other note, the new Bloody Mary is exceptionally good. I really hope that's not the case, as I can finish one, maybe two drinks before...it gets to be unpleasant. I hope you can share the tasting. So if you're interested in visiting the Office, will you really have to order and finish three items first? Maybe the drinks are smaller? I hope so...having a 3 drink minimum makes me far less likely to visit The Aviary. jesteinf wrote: Maybe the drinks are smaller? My understanding is that the drinks are indeed smaller. Our waiter mentioned that the bottles for the dark and stormy are the smaller bottles (I am guessing same size used for their kitchen table). All my "old" favorites were on the prix fixe, but some new additions present in the a la carte were interesting. And much more difficult if you want to just "stop in for a drink" before dinner at Next, Girl and the Goat, Publican, etc. Even if the drinks are smaller. They do still offer a la carte for now though and they might not change it. I just wanted to clarify that was my understanding from what the waiter said and might very well not be what they end up doing in the end. I do agree with you though, as much as I like good cocktails, I want to enjoy the freedom of choosing how much more to drink as I am drinking rather than up front. The table next to us a couple of weeks ago was doing a tasting menu. The drinks were definitely smaller. I'm struggling to see how you could ever go fully tasting menu format and keep the Blueberry on the menu, without making the portholes smaller. Or perhaps "Blueberry for two"? planning on checking the aviary out on thursday after my diner at everest. if my wife and i show up around 11pm, what kind of wait should we expect? would i be more comfortable if i changed out of my suit into something more casual or will our formal attire not make us stand out too much? Your attire will be fine. Better to be overdressed than under, as my wife always tells me. Not sure on a wait, but I would doubt it. You'll be fine. Also a lot of people stop into the Aviary after dinner at Next, and people sometimes dress up formally for Next. So you probably won't be alone if you're wearing a suit. Waits tend to be short. You might find yourself at one of the standing tables by the kitchen for a little bit, while a table opens up. Has anyone been recently? Do they still have the tasting and the a la carte options? Heading to dinner at Next tonight for my birthday but I don't know if we are going to want to commit to 3 drinks each (even if they are smaller) after our dinner pairings with work in the morning. Also, considering the tasting menu drinks are smaller, is it a good value? The picture of the menu that is linked above shows the tasting menu being $45 ($15 each), and most a la carte drinks are $18. If the tasting servings are considerably smaller, this seems like a rip off. I was there two weeks ago and it was still half tasting half a la carte. We went on Wednesday (two night ago), and it was half a la carte, and half prix fixe menu. I did the prix fixe, while my two companions did a la carte. The prix fixe sizing seemed basically the same as the other, non-prix fixe drinks. We really enjoyed the chartreuse, peach, and deconstructed Bloody Mary, which weren't on the menu when we went at the end of June. Been lurking the boards for a while but decided to actually post and give some quick insight on my visit to the Office this weekend. I'm really not sure how/why we got in, but we did. My date and I didn't dine at Next and but we went to the door (10pm~ on Friday) we simply asked if there was any seating available in the Office. The gentlemen working the door, Marko, asked if we had visited in the past and my date barked out a "yes". He took both our first and last names and 20 minutes or so later we were ushered into the space. Perhaps he just bought the act but aside from that I'm not really sure why we got in. Regardless it was a great surprise and a great experience. Drinks were fantastic of course. The menu is very different than upstairs but it fits the the ambiance of the room. Morale of the story sometimes just asking works. Jandur wrote: Morale of the story sometimes just asking works. Has anyone gone around 9 on a weeknight lately? What are the waits like these days? Typically little to none. Tonight may be a different story. Newest blog: You paid how much? Yep, all those college kids home for the holidays! On Friday, it looked to be pretty busy all night, with a slight lull around 8pm. We arrived at 5:55pm for our reservation at 6pm and there was a sizable horde of people outside. It looked like chaos from afar. A bunch of parties with reservations, as well as walk-in groups being quoted a wait time of 20-30 minutes. There wasn't a clear line, so I checked in with the host outside, who had a long clipboard of names (including walk ins and requests for the Office). We huddled around an outdoor heater for a good chunk of time until they were able to seat us. We ordered two prix fixe menus, two a la carte drinks, and all of the bites over the course of 4 hours. Photos can be found here. Interesting to note how much turnover there is in the prix fixe choices, with the first two sections being completely different from my September visit. I first tried a delightful concoction of charred cinnamon with tequila, cynar, lemon, shaken and served over orange ice cubes. It was named Orange on the menu but didn't actually contain much orange! Smokey and a little fruity as the orange ice melted. The cynar added a nice bit of complexity. I enjoyed how the drink changed over time. I liked this but found it a bit overwhelming but my husband liked it so much, he ordered his own later on in the evening. My husband next chose the drink currently being served in a porthole, Cider. It contained apple brandy and verjus, as well as a host of other items: cinnamon, tea, cloves, fresh sage, fresh thyme, orange peel, lemon peel, apple slices, dehydrated currants, and more, all infusing stronger into the drink as it sat. Delicious and much more fruity and sweet by the end, but I think I preferred this summer's Blueberry since the base spirit was rye, which is a stronger contrast to the infusing components. The next cocktail was outstanding. Concord grape, port, rum, garnished with mint and Angostura orange bitter ice. Intensely flavorful and fragrant. The roundness of the port paired very well with the grape, as did the orange bitters. This was also force carbonated for a little extra fizz. A very tasty and well balanced drink. After an In the Rocks (their old fashioned served in a giant ice sphere), I moved into dessert. 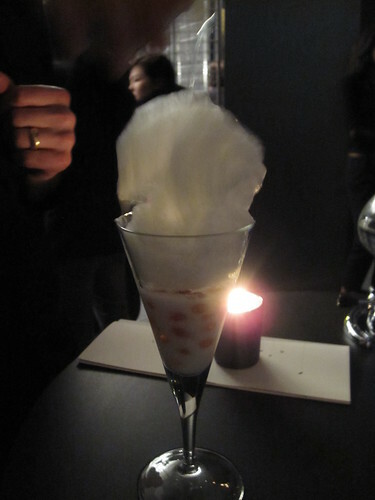 Popcorn: served hot, rum and popcorn stock, topped with a salted caramel foam. This was essentially salty caramel popcorn in liquid form. Delicious but also very intense and I could only take a few sips at a time. If you like Crackerjack, you'll love this drink. Meanwhile, my husband moved onto Amaro, served on a wooden stave, in an old fashioned glass filled with smoke, which was dramatically lifted upon serving. 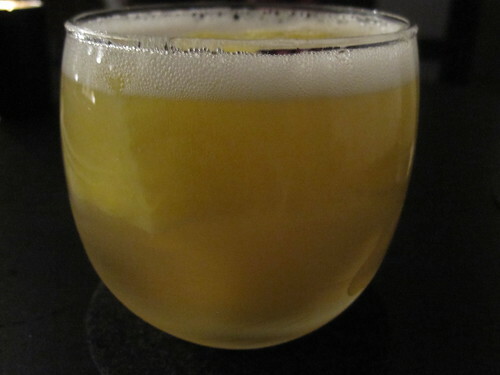 The cocktail contained Cocchi Americano, tequila, and their housemade flat root beer, containing 20 ingredients, and meant to emulate an Amaro. Very complex, bitter, and medicinal. A fascinating drink, especially for Amaro fans. Our last drink of the evening was the Hot Chocolate. Served warm, it contained Honduran chocolate, ancho chili pepper, and wheat whiskey, topped with a red bell pepper foam. Unusual? Yes, to say the least! It smelled amazing and had quite a kick to it as well. So satisfying on a chilly November night. And of the bites, we tried them all. I loved a spicy scallop ceviche served on a shell, a creamy bite of crab and avocado, hot tempura-ed apple and brie that exploded in your mouth, as well as a chocolate bite with stout and peanut that also liquidified once hitting the tongue. The standard potato, foie gras, and wagyu were delicious as well, and I believe these three are mainstays on the menu (they did not seem to have changed since September). The others were good, but not as memorable. A couple of chef friends in town for business offered an excuse to visit Aviary. I figured we wouldn't be able to get in, but checked their facebook page and followed the suggested instructions for requesting same-day reservations. My email was answered promptly with a "yes", and when I followed up to see if we could add one to our reservation, they were very accommodating. We arrived right at our reservation time and were seated nearly immediately. It's quite roomy in there and it appears that they either underbook the room so as to leave room for walk-ins, or there just weren't that many people trying to get in last night, because it really was never all that busy (or at least it didn't feel that way). The take away: we were completely blown away. After looking at both the price fix menu and the ala carte offerings, we decided to do everything a la carte. We each ordered three drinks (mostly different ones) and I think by the end of the night we each ate at least one of the small bites. My pictures came out really bad, so I'm not going to post them. Difficult to remember everything without looking at the menu, but I remember that we all loved the Chartreuse trio of drinks, the Cider (which is the current offering served in "the porthole" was amazing in how much the drink changed over the 15 minutes or so that it sat on the table. The "2 in 1" with the mini bottle of Campari like bitter soda was great at first sip(s), but I wouldn't want to drink an entire glass of it. 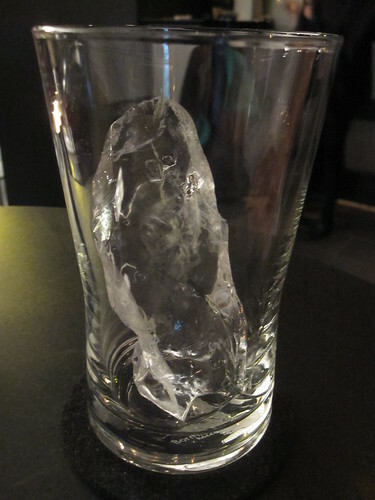 The "in the rocks" is clever, but just a one-note drink (although a very nice one note). We all loved the ginger drink and the hurricane, both of which blew us away with their balance. What really got us, though, was the food. Amazing, perfect little bites. Each just so packed with clear, concentrated flavors, that we could not get over it. 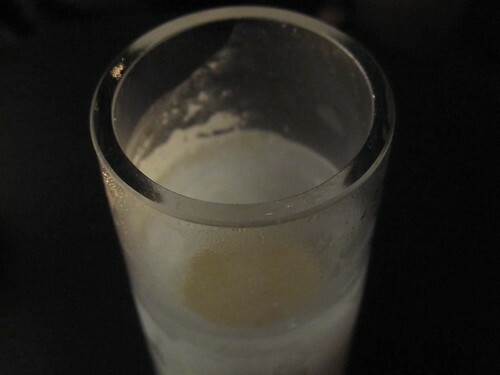 These bites, to me, are a perfect little encapsulation of what works so well at Alinea. In fact, the two of us that have dined at Alinea agreed that, in some ways, we actually preferred eating the little individual bites because they are so focused and straightforward vs. some of the dishes we had at Alinea, which just have so much going on that it can, at times, be somewhat overwhelming. My favorite of the bites were the duck rillettes with hazelnut tuile, the apple tempura with it's cheesy liquid center, and the chocolate cherry bite. All of these were just amazing demonstrations of contrast and balance. As chefs, we all agreed, we were humbled by how simple, straightforward, and concentrated the flavors in these bites were. So, we absolutely loved The Aviary. I was prepared to be impressed, but not to the degree that I was. 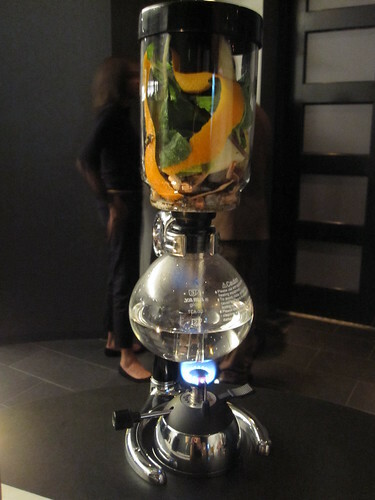 To me, it's a perfect "intro to Achatz" for those who don't want to spend the $500/4 hours that eating at Alinea requires, and, honestly, I think I preferred Aviary for it's more loose, low-key atmosphere. We were so engaged in tasting and talking about all the flavors we were experiencing that it didn't really dawn on us how little food we'd eaten. We didn't feel hungry after we were done, even though we'd each eaten only 9-12 bites of food, probably because each of those bites was a perfect little meal all to itself. That didn't stop us from heading over to Girl & the Goat afterwards for some beers and shared plates, of course! Anyway, Aviary is just fantastic. It's going to be my go-to suggestion for visiting food-focused friends from now on, especially now that the intimidation factor of thinking I'd never be able to get in has been proven a non-issue. I loved everything about it and will be back as soon as I can come up with an excuse to justify it. Edzo's Evanston on Facebook or Twitter. Edzo's Lincoln Park on Facebook or Twitter. Had a really nice time at The Aviary this past Saturday. Two of us arrived sans reservations at 10pm and got a gallery/standing table a little after 10:45pm. We didn't mind standing (although my feet in high heels did! haha), and it was fun watching the cocktails being made. The service was more friendly than my last visit over the summer, which I liked. I think I prefer The Violet Hour and The Drawing Room over The Aviary, but for a special occasion, I think this is a wonderful spot. They hand chip the ice for their drinking water. 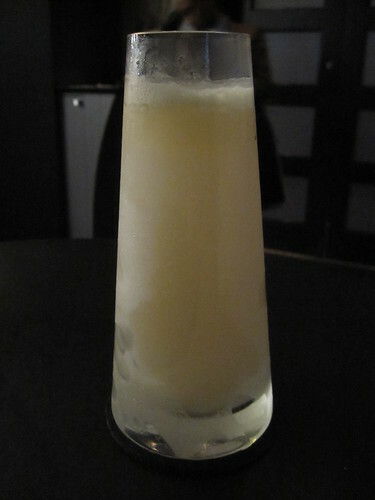 El Bulli Pina Colada. 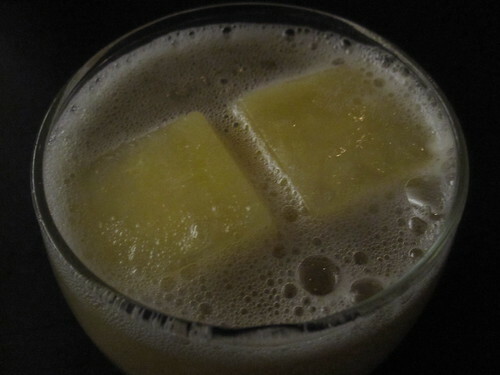 The rum spherications were fun to burst in your mouth and reminded me of bubble tea but with a much softer texture. The Oolong currently has pistachios, almonds, basil, and orange peel. The Pear. The ice lined the glass. As others have said, the ice melts REALLY slowly in all of their cocktails. Something with "punch" in the name. They top it with champagne at the table. If I remember correctly, I think those are pineapple ice cubes. Despite the "late unpleasantness," upthread, we had since buried the hatchet, and I quite enjoyed my last couple visits, both upstairs and down. I hope whatever's next for him is equally challenging and boundary-pushing. In contrast to many comments out there, I doubt we'll see much, if any, re-concept of the establishment. If anything, I get the impression that the previously rumored expansion may be imminent. at The Stew, Phil Vettel wrote: Charles Joly, the nationally known mixologist who made The Drawing Room one of the top cocktail lounges in the city, is leaving to become the new beverage director of The Aviary. Pretty exciting news for us imbibers. Yeah, except now you have to go to Aviary. Me, I was already planning to hit Drawing Room in late July, so now I'm happy to be getting there in the nick of time! Vitesse98 wrote: Yeah, except now you have to go to Aviary. Or, perhaps not. Joly's last day at TDR will by July 14th. Note: Joly will not start at the Aviary until after Tales of the Cocktail (July 25 to 29). Another wonderful trip to The Aviary last week. It was insanely hot out, so we sat inside. 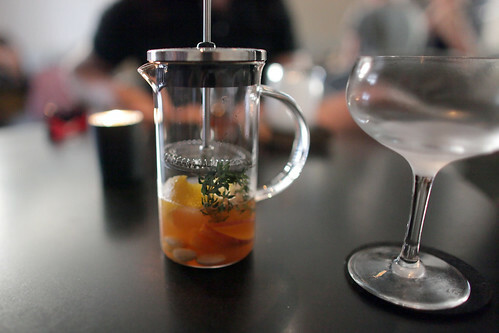 An infused drink that is strained table-side, using a French press. The scotch was definitely in the background in this drink, as the other flavors overpowered it a bit. 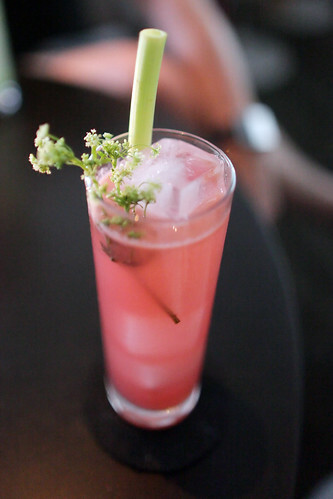 Containing vanilla ice, a borage garnish, and a lovage stem as a straw. Well balanced and refreshing. 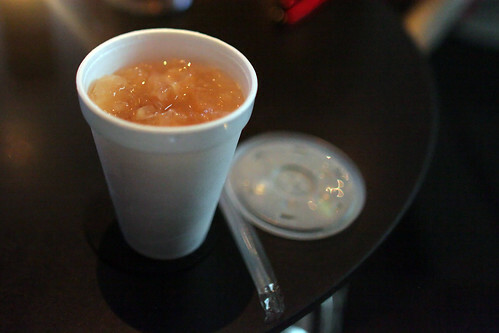 House-made rice milk with agave nectar, tequila, rum, served over cracked cinnamon ice, in a styrofoam cup. Not too sweet, not too boozy, just right. I wonder if they let you exit with this drink, given that it's already in a to-go cup. 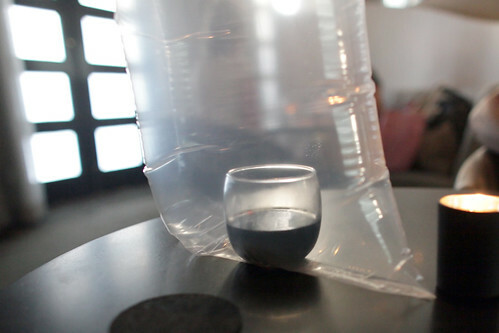 The cocktail is served in a plastic bag filled with lavender air, created using dried lavender and lavender oil in a volcano vaporizer. The bag is cut tableside. Wonderful aroma. The drink itself was also very good, with the Pedro Ximenez providing a nice, round finish that lingered on the tongue. 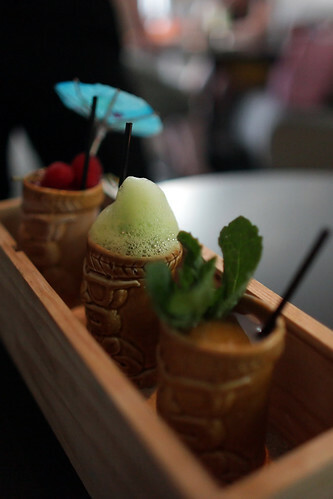 A flight of tiki drinks, served in a wooden box, filled with sand and shells. From left to right: Knickerbocker with cocktail umbrella ‘blown’ inside out as a tribute to the Windy City, a Zombie with a fennel foam topping; and a Mai Tai served with orange juice ice. The Zombie was the best out of the three, and, surprisingly, not very boozy.